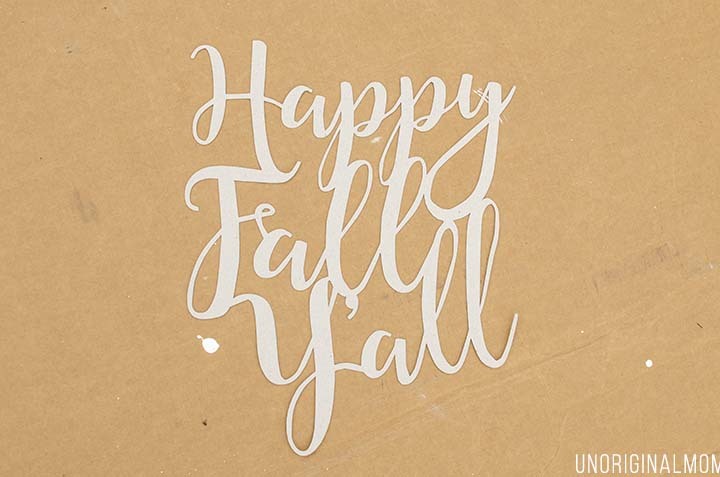 I’ve been looking forward to the start of fall for a while now, but our family just got back from a week at the beach (gotta love the beach house price drop in September) so I’m still trying to get myself out of summer mode! I actually started decorating for fall a little bit before we left, so our house is a combination of lovely fall decor elements mixed with sand toys and beach towels that still need to get put away. 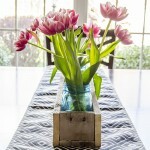 How’s that for a new decor trend? Heh. I still have a bit of work to do to finish my fall decorating (including our front porch, which is always my favorite part! 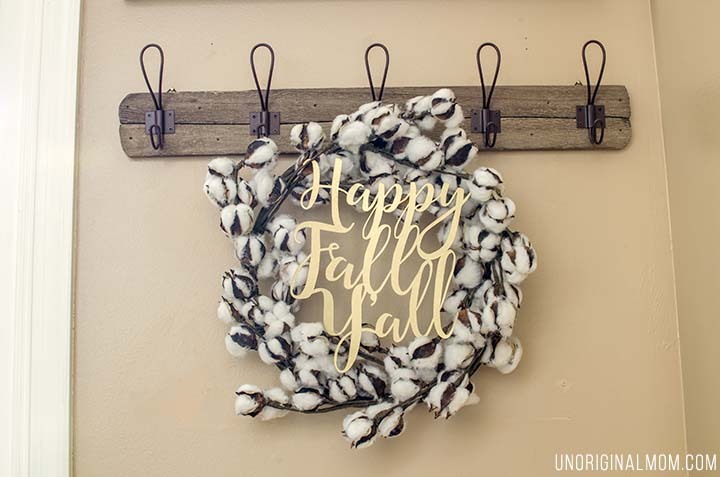 ), but I thought I’d share one of my favorite elements so far – this trendy natural cotton wreath with a “Happy Fall Y’all” cut-out. 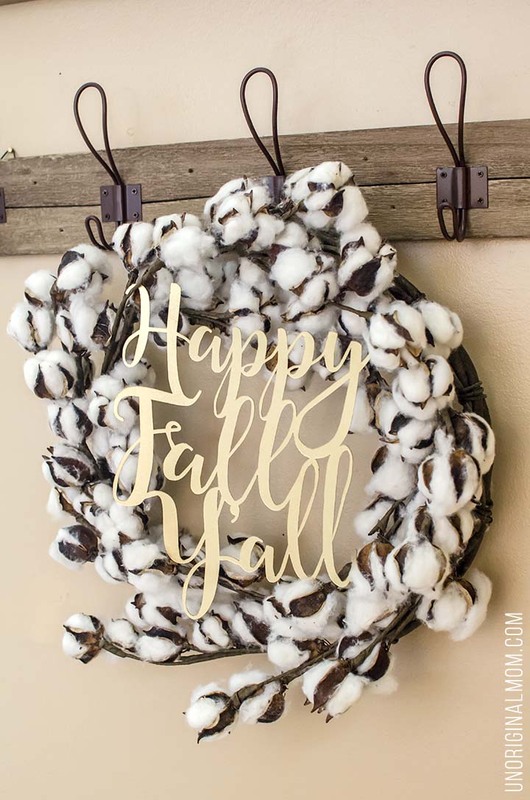 I snagged the cotton wreath from Decor Steals a few weeks ago and knew I wanted to add some kind of extra touch to it…and when I came across this beautiful wreath on Pinterest I knew I wanted to try to make one myself! 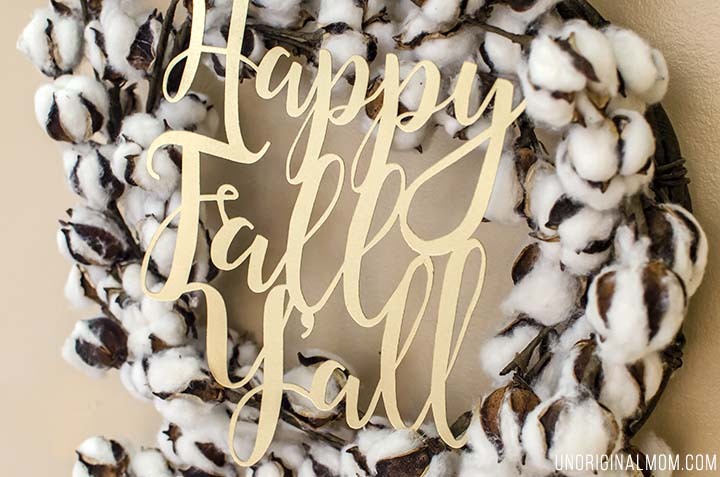 I’ve always loved to put a little “rustic glam” into my seasonal decorating, so I thought this juxtaposition of the gold fancy lettering with the rustic cotton wreath would be pretty and fun. I am really pleased with how it turned out! For those of you with a Silhouette machine, this is a super simple project (made even simpler with the free cut file that I’m sharing!). I’ll give you the quick step-by-step of how I whipped this up in less than 30 minutes. 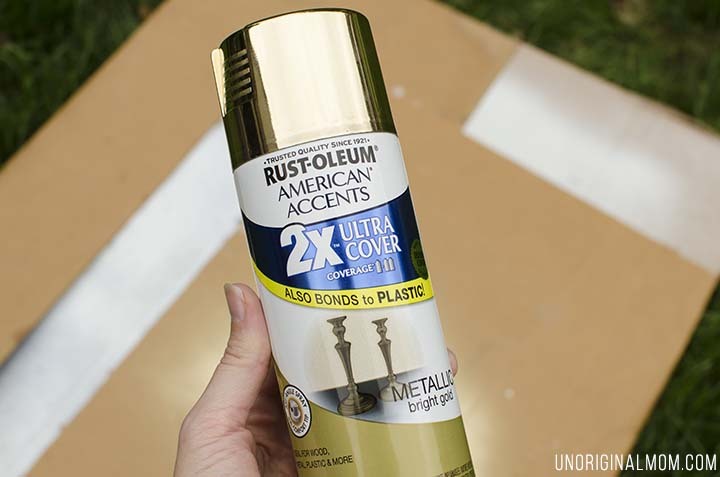 Then I used some Rust-oleum metallic bright gold spray paint I had leftover from another project to glam it up. 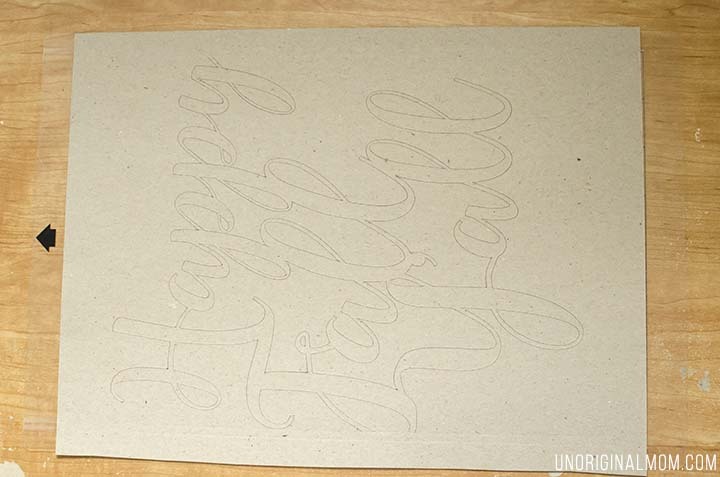 You could skip this step by just cutting your design out of gold foil heavy duty card stock (or whatever color you’d like) but this is all stuff I already had on hand! Just a few quick coats is all it took. And it was dry in no time! Then I just tucked the lettering inside of my cotton wreath. Voila! Instant rustic glam. Hey Silhouette users – do you want this free cut file? Of course you do! 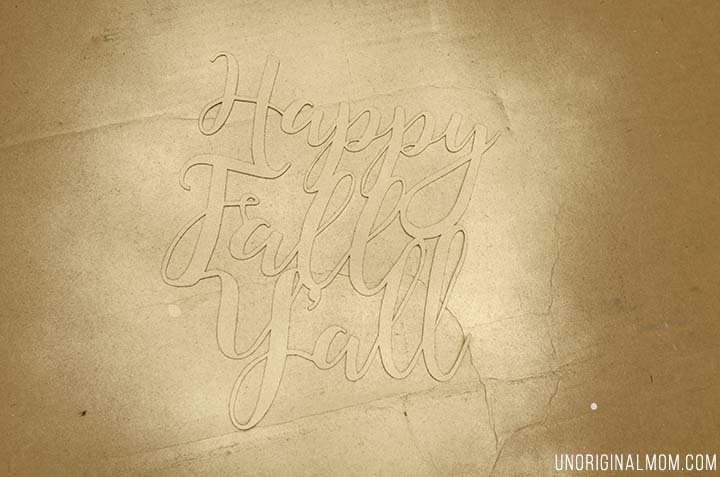 You could make your own wreath lettering like I did, or just slap this “Happy Fall y’all” design on anything you like – a t-shirt, sign, or even a pumpkin! 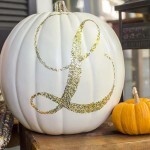 (How cool would it look in glitter on a faux pumpkin like I did with this one?) This cut file is part of my Silhouette cut file library – get instant access by subscribing below! The inspiration doesn’t stop there, friends…it’s time for our quarterly Silhouette Challenge, with a theme of FALL! This time of year really gets my crafting gears moving again after a lazy summer, and I’m always looking for more ideas. 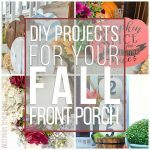 You’ll find a wealth of fall inspiration in the projects linked below – click directly on the image or the links underneath to browse around these fabulous fall projects! Meredith, this wreath is so beautiful and the gold wording is a beautiful touch! I’m obsessing with any project involving gold spray paint these days ;) Thanks for the Silhouette inspiration! Love your glam sign and how your wreath came together! It’s perfect! Great idea! Love everything about your project. The wreath is perfect! LOVE this wreath!! I bought a cotton wreath a few months ago to add to our gallery wall in our new home (which is still a work in progress….one day I WILL finish it!). I love the way you customized yours for the season, and that gold spray paint is just so perfect. Thanks for the inspiration and great tutorial! Gorgeous fall wreath! I love how you created the word sign. First look I thought itvwas wood! Love it. Thanks for the tips and tutorial!